Does your dog lunge, bark, snap, go berserk or just get out of control at the sight of another dog or person? Learn how to prevent trouble and turn anxiety-ridden walks into relaxing, peaceful strolls! 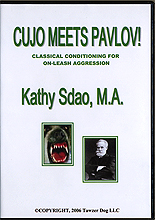 This is a full day workshop that combines lecture on the science of classical conditioning with hands-on demonstrations using dogs that lunge, bark, or snap at other dogs. Kathy teaches how to humanely correct this behavior, using techniques that are also applicable to dogs that display aggression to people.